There's no need to ask Prime Minister Roosevelt Skerrit on whose side Dominica will be standing as Venezuela slide further into colossal chaos last week with a very likely confrontation, in Venezuela, between super powers America, Russia and China. But Venezuela's mainly self-inflicted wounds have been festering for so long that there is an almost inescapable sigh of relief that that oil-rich South American country's long-lasting pain may be coming to an end. Dominicans must be concerned about the situation confronting Venezuela, after all Prime Minister Roosevelt Skerrit and the current (some say former) president Nicolas Maduro and the late Hugo Chavez have been more like fathers and son to Mr. Skerrit as Dominica, in spite of the awful economic and social situation in Venezuela, that Latin American state has been a major sponsor of our impoverished country. As we said earlier, Dominica has been placed in an "unfortunate position" of having to persist with its support for the Nicolas Maduro dictatorial government in Venezuela against freedom fighters and street protesters. This stance has placed it at odds with the Trump administration of the United States as well as some major members of the democratic world such Canada, the European Union and many major Latin American democracies. In support of Maduro, Dominica is in step with non-democratic countries such as Russia, Cuba, China, Syria and Iran. But that's not too difficult to understand. Dominica's foreign policy is based mainly on the mighty dollar- who gives us more money whenever we ask in exchange for votes at the United Nations. Down the drain, probably forever, goes our support for human rights, decency and basic electoral freedom. 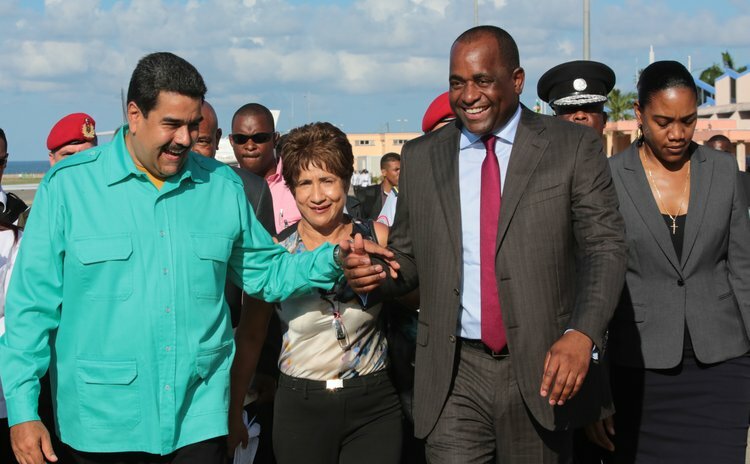 Since developing a close relationship with Maduro's predecessor Hugo Chavez, Skerrit has depended on Caracas to prop up his social programmes here through various means, including PetroCaribe, the oil discount scheme that Chavez started. However, because Venezuela's economy has virtually collapsed, there has been growing unrest across the country, with hundreds killed and injured during protests to demand elections, freedom for jailed activists, foreign humanitarian aid to offset the economic crisis, and autonomy for the opposition-controlled legislature. Maduro has accused the protestors of seeking a violent coup with the help of the Trump Administration. Maduro's government, of course, has issued "alternative facts" about the situation in Venezuela. However, over the years a rift has developed within CARICOM over the situation there, when five members backed attempts by the bigger members of the OAS to kick Venezuela out of the hemispheric body unless Maduro moved to call elections that is free and fair. Dominica, together with Antigua, St Kitts, St Vincent and Suriname were among ten countries that voted against a special meeting to discuss the Venezuela situation, with Trinidad abstaining and Grenada choosing to visit the bathroom in order not to vote. However, Bahamas, Barbados, Guyana, Jamaica and St Lucia were part of the 19 OAS members that voted in favour of the special meeting. "Dominica is in the unfortunate position that it cannot not align with Maduro. Skerrit cannot make any shift now, he must go with the minority vote – a rather interesting scenario and one that will have implications for Dominica/US relations, and by extension US/OECS," a foreign relations expert told The Sun. The extent of the split has been highlighted in a letter from Ralph Gonsalves, St Vincent's prime minister, to his CARICOM counterparts, in which he complained that a wedge was being driven through CARICOM over a plan for "regime change" in Venezuela. Fast forward to last week when Venezuela became the only country in the world with two presidents and two governments; Juan Guaido, the leader of the National Assembly swore himself in as the legitimate President of Venezuela. According to Bloomberg, President Maduro quickly severed diplomatic ties with the U.S. last week Wednesday after US President Donald Trump publicly backed the opposition's Juan Guaido as the legitimate leader of Venezuela and gave U.S. diplomats 72 hours to leave the country. (It was later move to one month). Secretary of State Mike Pompeo responded to Maduro by saying the U.S. doesn't recognize his authority and therefore won't pull its staff. "We call on the Venezuelan military and security forces to continue protecting the welfare and well-being of all Venezuelan citizens, as well as U.S. and other foreign citizens in Venezuela. The United States will take appropriate actions to hold accountable anyone who endangers the safety and security of our mission and its personnel," Pompeo said. Meanwhile, Russian president Vladimir Putin warned the United States against meddling in Venezuela. President Putin telephoned Maduro and "emphasized that destructive external interference is a gross violation of the fundamental norms of international law." In addition, China Foreign Ministry spokeswoman Hua Chunying called for all sides to calmly and reasonably find a peaceful solution. "China supports efforts made by the Venezuelan government to protect the country's sovereignty, independence and stability," Hua told a regular briefing in Beijing. "...I want to emphasize that outside sanctions or interference usually make the situation more complicated and are not helpful to resolving the actual problems." Over the past decade China has lent over $50 billion to Venezuela through oil-for-loan agreements, securing energy supplies for its fast-growing economy; so, one could understand that China is inclined to take action to support Venezuela, that is President Maduro, to protect its investment. But what is more worrisome is that the US has been preparing possible oil sanctions, and Trump said that he wouldn't rule out military options. Dominica and the other countries that stood behind Maduro say they are upholding their policies of non-interference in the internal affairs of another country but we argue that by supporting Maduro against the opposition forces, who maintain that Maduro has conducted a sham election, is in fact a tacit interference in the affairs of Venezuela. In the final analysis, Dominicans have to pay keen attention to the latest crisis in Venezuela because, to a certain extent, the situation in Dominica has disturbing similarities. We do not know how the impasse will end but Venezuela now has another opportunity to solve its problems without interference from friends and foes.